Is is a great site for language arts teachers. Each skill and strategy comes with a full lesson plan aligned to the common core standards. Each lesson plan contains a unit with one or more lessons. Lessons contain the book and lesson plan, student vocabulary builder, teacher and student materials and assessments. This site also has over 1,000 nonfiction passages. Search by keyword or lexile level to access passages and questions sets in any subject area. This site is great for math, science and social studies teachers. It’s free to register and download materials. Don’t focus on grade level. Focus on your student’s needs. Most teachers have students, who read a various different levels, remember you know your students well. On the IWB: Display a passage on the board and have students highlight and extract text. Tech Tip: Send the Passage and Questions sets to students via , Edmodo, Google Drive or use annotation app like notability to answer questions and have the students submit them back to you. Open library is a great way to find free books online. This website has over 20 million of books to share. Search by subject area or author or even upload your own books. This site has many of the classic novels taught by teachers today. There is also an e-lending library accessible to view books. Once a book is selected you may read it online or play the audio version. You can also share a link the book or embed it online. There’s also a great feature that allows you to search the text of the book. Choose pictures then drag-n-drop your words onto the picture to express what it means. Use the various parts of speech to ignite student thought. Create short stories or just a simple expression. This web tool also allows you to freestyle and enter your own words. Save the pic lits to your computer and create a classroom gallery to show the student's growth over the year. This is a great site to use as a bell ringer or for a closing activity. Students will love to come to the board when you mix pictures relevant to them in with your content. On the IWB: Project an image onto the board and have each student contribute a word to the sentence. Have students create their own. Tech Tip: Available on all mobile devices. Story bird is an awesome website for building great novels. The fantastic art on the website is donated by various artists. Sign up with a free account to get started. Student accounts are also available. Click the create button choose your artwork and begin typing your story. Test student collaboration skills by having students collaborate. Once the story is published, you can share the link and embed the storybook on your website. On the IWB: Create a class story using Story bird. Have students create a story as the pictures appear or have them work in groups to create and share their own. Read books others have created. Tech Tip: Viewable on all mobile devices. 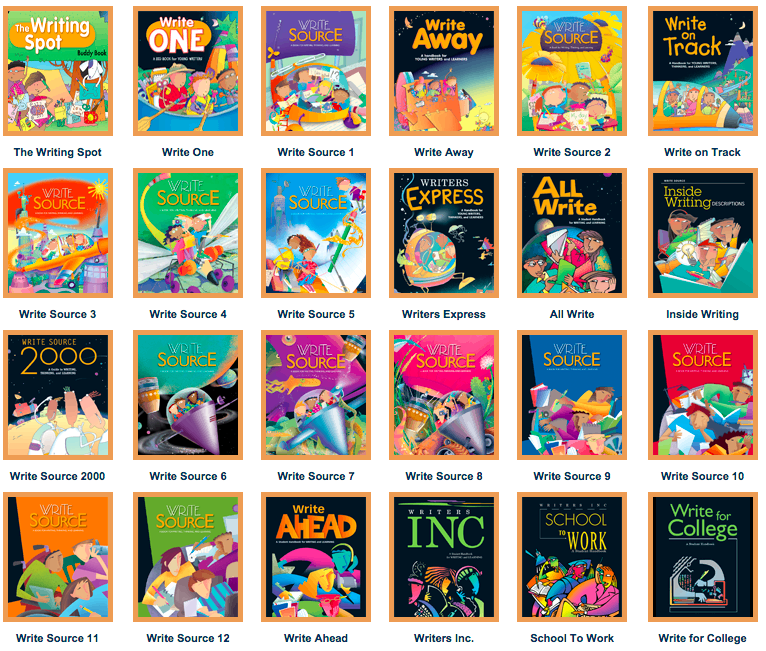 The Write Source- A great source for examples of student writing. Models are available for grades 1-12. Use these with your students to help them understand what good writing should be.